This is a different view of our criminal justice system in a way that challenges the negative portrayals from people considered experts. Contrary to the prevailing view of most experts describing a broken and inhumane system, something appears to be working. 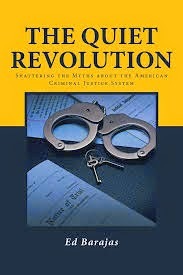 For the past twenty years crime has taken a plunge in the US and the experts appear to be clueless regarding the cause. Barajas suggests the reason for less crime is because of an ongoing transformation of the justice system that is more focused on public safety and working in concert with the community and other service agencies. 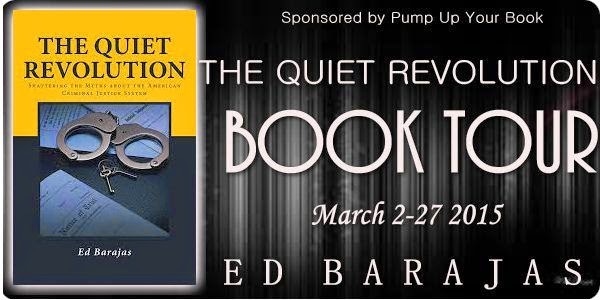 The Quiet Revolution is available at Amazon. Recent news from California suggests that crime has spiked in response to court orders and new policies to reduce prison crowding. This should serve as a lesson in how bad policy leads to disaster. Other states are currently attempting criminal justice reform but should pause to consider some crucial questions. Criminal justice certainly needs major improvements. The problem is that the current reform movement is actually an anti-incarceration effort. This movement has been active for several years but rather than a systemic approach to reform, its main goal is to reduce incarceration. This is like trying to reform healthcare by aiming to reduce hospitalization. Just as hospitals are a small part of the healthcare system, prisons are a small part of the criminal justice system. Reform efforts are wrong headed because they’re based on a false premise—mass incarceration. The object is to place more offenders in alternatives, or community supervision, by using misleading information that prisons are a drain on the economy and needlessly used on the wrong types of offenders. Despite rhetoric about “mass incarceration” and calls for "alternative sentences" the major portion of offenders is serving time in an alternative status of community supervision. About two thirds of individuals serving time are under community supervision. One could say that in this country incarceration is an alternative sentence. In some states the community supervision population constitutes more than eighty percent of the total corrections population. Experts in the reform movement rely on misleading assumptions about safely releasing large numbers of non-violent offenders. Experts provide the answers but we need to ask the right questions. Should we only incarcerate violent offenders? Should we never incarcerate car thieves, burglars, drug dealers, swindlers and others? The California crime spike involves a high number of these types of offenses. What exactly is a non-violent offender? Is it someone who’s never committed a violent crime? Is it someone convicted of a non-violent crime but with a history of violence? Is it someone who committed a violent crime but was convicted of a non-violent crime because of plea-bargaining? Al Capone was convicted of tax evasion. Without asking these questions, he’d be considered a non-violent offender. The point is that sentencing statistics provide only a snapshot of the person's current offense. The reform movement thus demands that the system do what it’s already doing and has been doing for decades—incarcerate only a relatively small proportion of offenders. We’re also told that we should spend more money on education rather than on prisons but the fact is that our country spends ten times more on education than on prisons. The problem is not too many people in prison. The problem is the system’s misguided purpose. The system is never tasked with confronting crime. It processes cases. It reacts to individual acts of criminal behavior after the fact. This is what must change. Instead of a reactive system focused responding to individual criminal acts we should have a true public safety model of justice that's focused on crime prevention and reduction as well as creating and maintaining safer communities. of crime prevention by focusing on specific crime related problems, have spread to the other justice components during the past twenty years. Community courts, community prosecution, and community corrections are now becoming the norm. This has resulted in a remarkable drop in crime. Community courts are now within neighborhoods to respond immediately to “quality of life crimes”. They sentence offenders to clean up crews and/or drug treatment. Community prosecutors work with citizens to evict drug-dealing tenants from buildings. Community corrections (probation and parole) officers have gotten out from behind their desks to patrol the streets with police, clergy, and social service agencies to have more effective control of those under their care. These strategies have produced remarkable results. The homicide rate fell 51 percent between 1993 and 2012 from 9.5 per 100,000 residents to 4.7 per 100,000. Property crime also fell sharply during that time. Auto theft dropped an astounding 62 percent. It’s likely that these trends will continue into the future. These phenomenal changes in criminal justice are not the result of passing more laws. The criminal justice system has changed its operating practices and partnered with the community and other system components. This is what makes this truly revolutionary. Instead of an endless cycle of reform the system has begun to transform itself. This bottom up change tends to confound those accustomed to top down modification through new legislation. Reform movement experts remain clueless because they persist in trying to affect change at the legislative and judicial levels. Meanwhile the criminal justice system continues its quiet revolution. Ed Barajas retired from the Federal Bureau of Prisons after twenty-seven years of service, including twelve years in three maximum security prisons. He began his career as a correctional officer right after graduating from college. He worked his way into management and administrative positions, including ten years with the National Institute of Corrections in Washington, DC. He has been a guest lecturer at universities and has written chapters of criminal justice textbooks and published articles and guest editorials in various periodicals. He and his wife live in North Carolina. Interesting take on transformation as opposed to reformation....though I'm not clear what the difference is. You note that "instead of a reactive system" there needs to be more emphasis on community based solutions. I agree with that 100% except for the "instead of" part. It makes sense that both the reactive and proactive approaches to dealing with criminal behavior merit transformation.